Sinfully rich, these sweet baked treats have a saintly mission: to help people escape poverty. Guilty pleasures? Not these brownies. Sure, they're sinfully rich: classic chocolate fudge, vegan fudge, brown sugar blondie with chocolate chips, and snickerdoodle. But go ahead and treat yourself: every bite helps a baker's dozen of social programs flourish. Founded by a Buddhist in 1982, Greyston Bakery, a fellow B Corp, hires workers who typically wouldn't be hired by most companies because of their past or present circumstanceswith no questions asked. Employees, instead, prove themselves on the job. A range of resources, including child care, community gardens, workforce development, and sustainability programs, helps support their efforts. The chance to have a stable income while developing their knowledge and skills has transformed many employees' lives, and helped alleviate some of the poverty of the Yonkers community. Of course, none of this would work if people didn't crave their baked goods like crazywhich they (and we) do. (They baked our founder's wedding cake.) But don't just take it from us: Ben & Jerry's (another fellow B Corp) uses only these brownies in its ice cream. Baked with love in New York State. The product arrived much sooner than I expected and, of course, was fresh. This was a thank you gift and everyone appreciated the story. Not to mention the brownies were really good. They made a great gift. Everyone was intrigued by the story behind the brownies. Not only did they think they were delicious, they love their message. Ate it with milk, coffee, or by itself. Love the different choices in flavors and hope they come out with more. I don't normally write reviews for this sort of thing, but a friend of mine sent me these as a birthday gift and so far I've tried them all and the vegan brownie might just be the best brownie I've ever had. 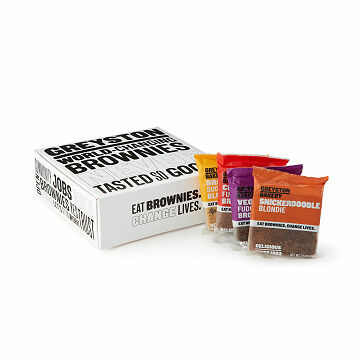 I would buy a box solely of the vegan brownies. Never thought I'd say that... but man, these are next level!! My favorite brownie surprised me as it was the Vegan Brownie. It had the most flavor even over the Chocolate Fudge Brownie. I like Brown Sugar but this brownie needed more butter for flavor. Snickerdoodle did have the cookie taste, but didn't match the Vegan for flavor and taste. I'm not Vegan, so that's not why I preferred it over the others!